Although we go to great effort to assure that our location coordinates are correct, we do not guarantee the accuracy of the locations. But we do want to know if, for example, our directions bring you to the middle of a lake rather than a book sale! To report any problems, please send us an email. Find Book Sales and Book Stores WHEREVER YOU ARE! There is no need to download a special app; it works with any phone, tablet, laptop, or desktop with an Internet connection. 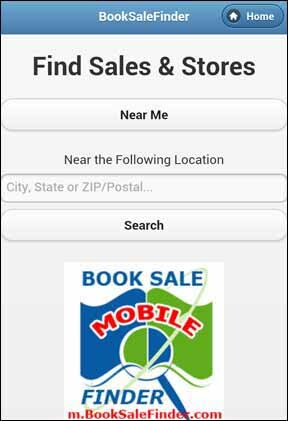 Touch 'Near Me' to find book sales and book stores within 50 miles! Your device may ask if it's OK to use your current position - just touch yes. 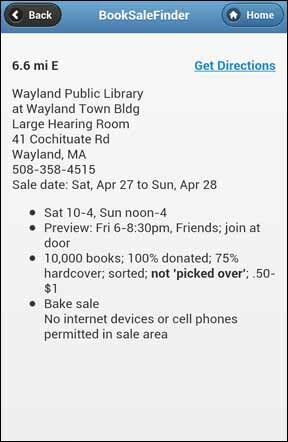 Notice that you see the dates of each sale (up to 2 weeks in advance), along with the direction and distance from your location. 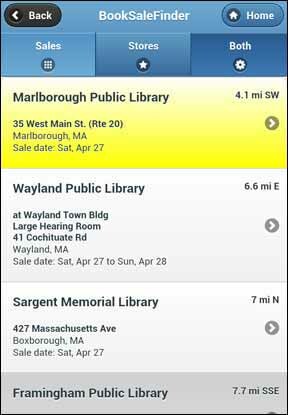 At the top of the screen, you can also touch 'Stores' to find used book stores within 50 miles, or touch 'Both' to find all sales and stores together on one screen. After you have decided which sale to visit, touch 'get directions'.